Enjoy winter under the Outdoor Living Pod™. Most homeowners around the UK will neglect their gardens during the colder seasons, as it is not advisable to spend time outside when the temperatures are on minus levels as this is uncomfortable and can cause unwanted health issues. This does not go to say that you are unable to make the most of your garden space because of these limitations. 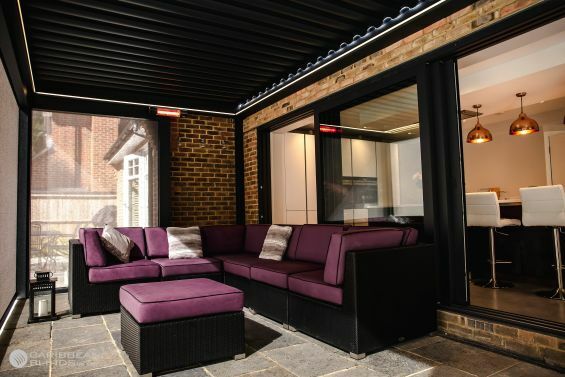 With the right garden feature you can create a dedicated outdoor living space that will provide warmth and shelter to reside outside comfortably. 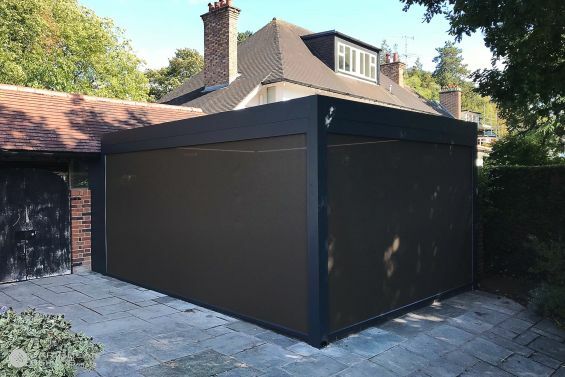 At Caribbean Blinds we have been completing gardens all over the country with our Award Winning Outdoor Living Pod™ that provides just that. 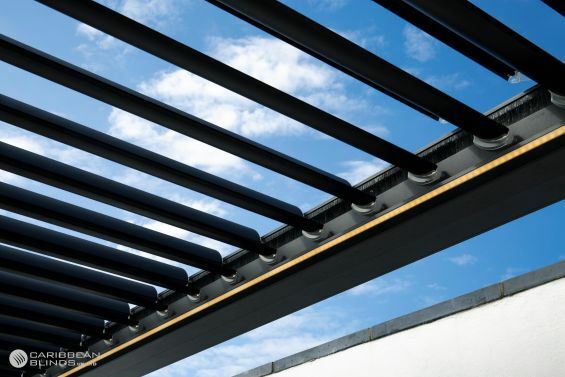 This aluminium pergola has been engineered with sophisticated weatherproof features designed specifically to battle the ever-changing British climate. 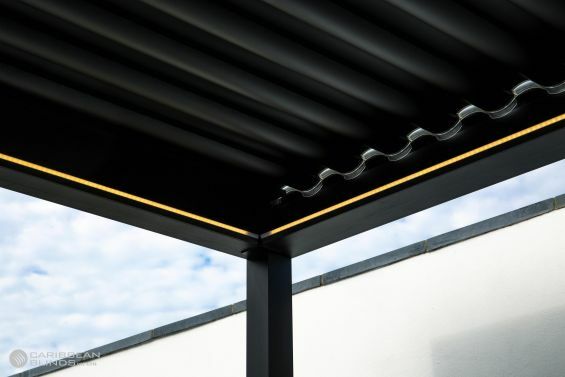 The highlight feature of this modern canopy is its automated louvered roof system, it can be remotely operated to rotate & slide (dependant on model) to give you sun, shade, ventilation and shelter when you need it. When completely closed the roof is fully water tight, with a guttering system built within the frame you can guarantee a dry living space all year round. 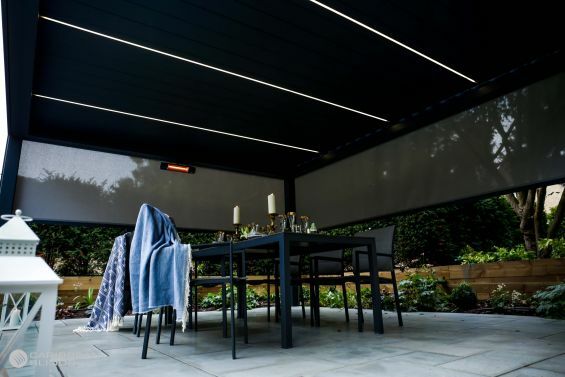 Within the cross beams of the louvered canopy sits side screens that can be deployed using a remote. These screens are another weatherproof feature that will provide you with protection against the elements. The screens have been designed with a ziplock mechanism to keep them strong against the winds and the fabrics have been entwined with a Nano Technology to make them resilient against moisture. With all the side screens deployed you can completely close of you’re the canopy to create an outdoor living room. 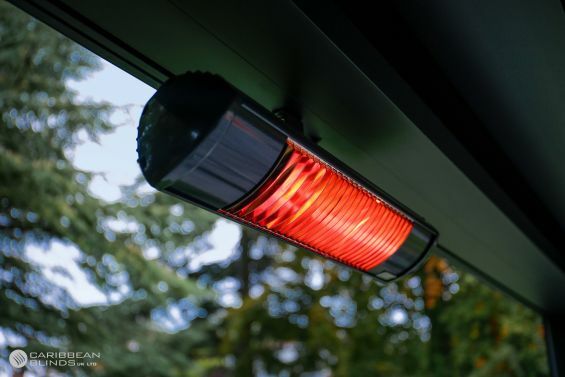 Infrared heaters is the third feature that completes the indoor-outdoor feel, by positioning these heaters around your furniture layout you will create a warm ambient setting that you will not want to leave. 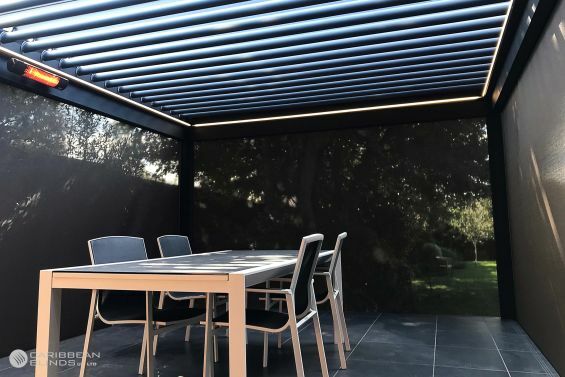 With all these features combined the Outdoor Living Pod™ is the ideal all weather garden canopy, its adaptable design lifts the confines of winter and prolongs the amount of time you spend outdoors. At Caribbean Blinds not only do we transform exterior spaces but we also enhance lifestyles doing so. If you are looking to change the way you use your home & garden then contact our knowledgeable team to discuss your options. 0344 800 1947 or alternatively you can use our quick enquiry form.